This is the fourth Eco I have read. Before, I have read The Name of the Rose, Foucault's Pendulum, and most recently, The Prague Cemetery. 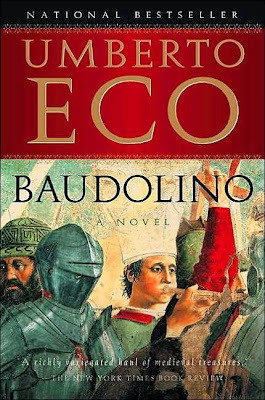 And so I picked up Baudolino, another historical novel that is set in the 12th century, thinking I would be in for another adventurous ride. See, this is about Baudolino, a European explorer who has the amazing talent of being able to learn foreign languages rather easily, as well as being able to lie easily. He was sold to Frederick the Great as a slave, later adopted as a child, and then later rose among the ranks to be an explorer heading to the East to find the kingdom of Prester John, a fictitious king. As the story progresses, Baudolino assembles a group of men to join him, and somewhere along the line, they get a Holy Grail involved, and soon enough everyone in the group has a motive to join the expedition eastwards. And somewhere in there, Frederick the Great dies. No one knows why, nor who did it. But the trip continues. And they meet creatures, both real and mythical. This book is perhaps one reason I don't stop reading a book without finishing it. See, I love historical fiction. But somewhere along the line, this book turned into fantasy. And somehow, every fantasy book I have read involves some sort of travel. Take for example Frodo's journey to Mordor. Here, it is Baudolino's journey to the kingdom of Prester John. And then the mythical creatures appeared, and then I thought that this isn't a historical novel anymore, but a fantasy novel, and therefore, somewhere along the line, I thought that I don't like this book anymore. But, this book keeps getting better. The fantasy travel section ended, and this book turned into a detective story. Who killed Frederick the Great? Where was the Holy Grail? To be honest, I enjoyed the last 50 pages way more than the 200 pages before that, which detailed the fantasy travel that the main character undertook. Eco is definitely a genius. Again, he was able to spin a story incorporating actual historical characters, blurring the boundaries between fiction and fact. Not only that, another thing I liked about this book was that this is a story within a story, as the whole story is actually told by the main character to another character. Hence, the perspective shifts back and forth between Baudolino's, who is telling the story to Niketas; and the omniscient narrator, narrating the story about Baudolino and Niketas. Overall, I find this book very complex and intriguing, even though there are not so interesting parts in the middle. Eco definitely has a talent that is worth paying attention to. I give this book 4 out of 5 stars.